A senior official of the Ministry of Corporate Affairs (MCA) was arrested by the CBI on charges of corruption, and hours after he was produced in court, his wife and daughter committed suicide at their apartment in Delhi’s Madhu Vihar. MCA Director-General Bal Kishan Bansal’s wife Satyabala (58) and his daughter Neha (28) hanged themselves on July22, 2016 afternoon at Neelkanth Apartments. The CBI conducted a raid at Bansal’s residence for the second time on July 21. Bansal’s son Yogesh Bansal, who ran a property business, had absconded since the CBI’s first raid on July 16. Bansal was the senior-most officer of the Corporate Law Service and used to provide recommendations to the ministry on technical matters, reporting directly to the Secretary (Corporate Affairs). He was arrested by the CBI on alleged charges of bribery and attempting to scuttle a probe against a Mumbai-based pharmaceutical company that had faced allegations of duping investors and diverting funds abroad. Bansal was arrested after the CBI allegedly caught him accepting a bribe of Rs 9 lakh, based on information that the agency had obtained from unidentified sources. The CBItold the special court that they had recovered 4-5 kg of gold and Rs 56 lakh in cash from Bansal. The agency alleged that Bansal had made “a settlement” with the private firm for Rs 50 lakh from which Rs 11 lakh was paid as the first installment. Mr BK Bansal was released on bail on last 26 August 2016. Mr Bansal committed suicide by hanging with his son Yogesh in home on morning of September 27. According to the information, Mr Bansal after his return from jail was very much in trauma. He was very saddened after the death of his wife and daughter, but his quotes were that life should flow ahead. The son Yogesh lived with the relatives in Hissar, but after the father’s release he arrived in Delhi. Yogesh was in property dealing business. BKBansal and his son both came to reside again in the same flat where he and his family had been living since the year 2004. 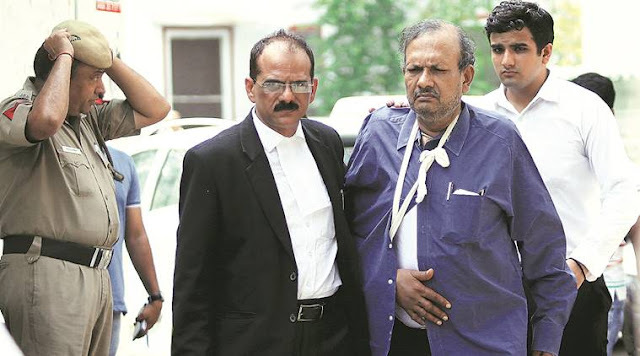 According to police, B K Bansal had called Pundit(priest) his home on Monday evening 6 o’clock. Giving Rs 2000 he had said to Pundit that they were going out of station for 10-15 days , so keep the money. Bansal had got some worship done by Pundit (priest) after the case registered in CBI. The worshiper (priest) was the last man who had met with Bansal before the committing suicide. According to information, a note before committing suicide was left in home on Tuesday, one page of which has been hand written while remaining are of photocopies of documents. He has given his relatives phone numbers and his photograph with suicide note. He accused CBI for tormenting. Bansal in the note has said about his wife and daughter’s suicide. He told how CBI officers were tormenting his family. Delhi police has taken the suicide note in their custody, and intimated to the higher CBI officers because they could inquire the investigating officers of BK Bansal. The suicide note of 5 pages has been written by Mr Bansal, while 2 pages of his son Yogesh; but what allegations are in the notes are not being disclosed by Delhi police. Bansal has written nothing about his property heirs. DCP said, they are sending the suicide note to the CBI so that they can view the allegations by deceased over its officers. However there has not been lodged any complaint in this connection. The CBI has expressed its sorry after BK Bansal’s death incident. Its officers have said the local police are probing the case. The officials are tight lipped including delhi police. Yogesh was neither accused in this case nor he was summoned by the CBI.The CBI was probing only bribe case which is still continuous.